Will all tell you that I am NOT a morning person. Unlike The Mistah who hears the first beeps of the alarm and bounds of out bed ready to start the day, I slap not one, but two alarms, several times each and every morning. I protest and struggle to raise my head from the pillow. I try and bargain for just a few more minutes under the covers before I have to face the day. Ultimately, the alarms win out and I grudgingly make the bed, unable to win a single minute more snugly burrowed beneath the covers I’ve managed to reclaim from The Mistah’s side of the bed. So you could say that I’m not terribly ambitious in the mornings. Since it’s all I can do to pry myself out of my percale cocoon, fixing breakfast falls to The Mistah. If you’re new here, The Mistah’s kitchen strengths are firmly grounded in reheating or opening and serving. While he is quite competent in the preparation of scrambled eggs, and recently omelets, he doesn’t have a broad range of breakfast recipes. So that, coupled with our attempts to stay South Beachy, means that breakfast gets pretty routine. Sometimes it is downright boring. I go through fits where I won’t even look at another egg, egg beater, or bowl of steel cut oatmeal, let alone start my day with them. After flipping through one of the South Beach books, The Mistah recently worked a new dish into the mix – Cinnamon Surprise. The only reason for this tangent is because you have to understand that when I say this, and even when I think it, it’s more like cinnamon SURPRISE! Imagine jazz hands and enthusiastic gesturing and tell me that’s not a fun way to start the morning. Who knew that cottage cheese, blueberries, and cinnamon could be so exciting. Anyhow, while I am not usually involved in breakfast preparation, I sometimes pitch in by cooking up something over the weekend that will appear on our breakfast plates during the following week. So when I read about Morning Glory Oat Muffins over at Honey & Jam, I thought they might be worth trying. Another totally random tangent – I forget how I found Hannah’s blog, and I haven’t tried many of her recipes, but I am completely captivated by her photos. The composition, the lighting, it’s how I wish my photos looked. But let’s get back to these cakey little muffins because paired with a slice or two of canadian bacon and some yogurt, this made for a breakfast worthy of jazz hands and enthusiastic gesturing. It’s not easy to elicit that kind of response from me at 7am so I offer that as a ringing endorsement. BAH Note: I used the shredding disk on my food processor to grate the carrots and apple which worked but definitely gave a chunkier consistency to my muffins. If you loathe the box grater as much as I do, don’t fret over not getting them finely grated. The muffins might not look as pretty as Hannah’s but they’ll taste just fine. After filling the paper lined muffin tins, I still had some batter left over so I baked it off in two ramekins. Truth be told, I think it would work just as well, and maybe be a little less trouble, to bake these in ramekins because I had a heck of a time getting the muffins out of the tin. You may even try baking this in an 8 or 9 inch cake pan and forget about muffin tins and ramekins completely. BAH Tip: To make this truly South Beach Friendly, substitute Splenda Brown Sugar blend for the brown sugar. Heat the oven to 375 degrees and line a 12 cup muffin tin with paper liners that have been lightly sprayed with cooking spray. Place the flour, oats, brown sugar, baking soda, cinnamon, and salt in a large bowl and use your hands to get them well combined. Add the carrots, apple, coconut and craisins and use a spatula to get them fully incorporated into the dry ingredients. In a separate bowl, whisk together the eggs, apple sauce, vanilla, and orange juice. Add the liquid to the flour mixture and stir just until evenly moistened. Scoop the batter into the liners, filling almost to the top. Bake for 20 to 25 minutes, until slightly puffed and a cake tester inserted in the center comes out clean. Cool in the pan for 5 minutes and then turn them out of the pan to cool completely. If baking the batter in glass ramekins, removing them from the ramekin to cool completely is not necessary. It’s really a morning glory. 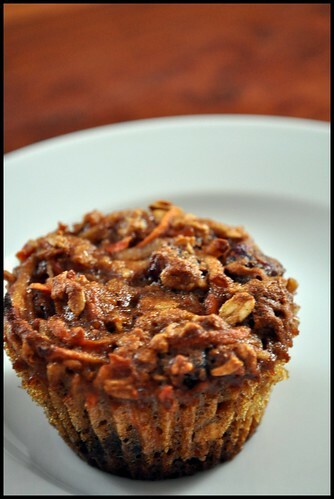 I really wanna make this muffin tomorrow morning. The one thing I noticed is that the muffins go kinda funky after only a few days…like two or three. So for storage, I’d suggest keeping them in the fridge. Or maybe wrap them really well in plastic wrap, stash in the freezer, and then take them out the night before for a gentle thaw. How was the coconut pudding in Thailand? That muffin looks yummy yummy. nomnomnomnomnom. I too, have recently mastered the art of omelet making. I just have to have the pan REALLY hot and then it works just fine. Had one yesterday as a matter of fact. See Boo, you’ve got more kitchen skillz than you give yourself credit for. Just be careful that your pan isn’t too hot otherwise you’ll overcook the eggs. Dry, rubbery eggs is no way to start your morning hon. And don’t feel bad about not being a morning person. I am a morning person and I hardly ever get anything other than oatmeal for breakfast, because I just can’t wait that long to eat. Oh, and I have a bad habit of being less than nice to my non-morning person Noel. Like yesterday, when I had him hulling 8 quarts of strawberries before he finished his coffee. Yeah, I’m that wife. What are you going to make with all those strawberries?